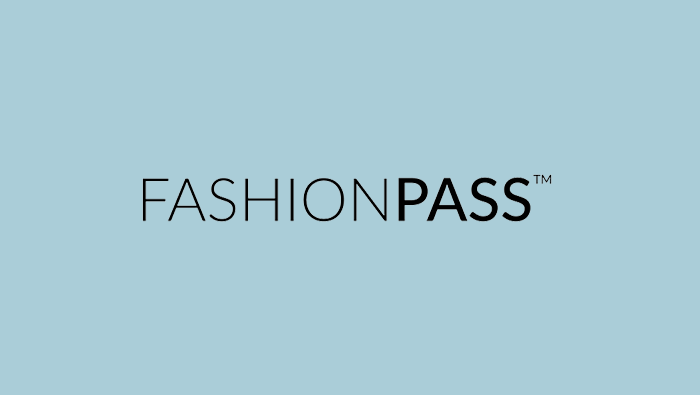 FashionPass is a service that allows people to rent and swap designer clothing and accessories as many times per month as they want. We believe that a great outfit has the ability to transform not only the way you look, but the way you feel. When you feel good, you can do anything. We are on a mission to provide women with the closet of their dreams, so they can land the job, make moves, and steal the show. Plain and simple, we are in the business of making women feel unstoppable. We have two main departments - marketing and development. ActiveCollab has been a life-saver for the latter. We mainly use ActiveCollab for three main development projects: our customer-facing website and two separate inventory management systems. 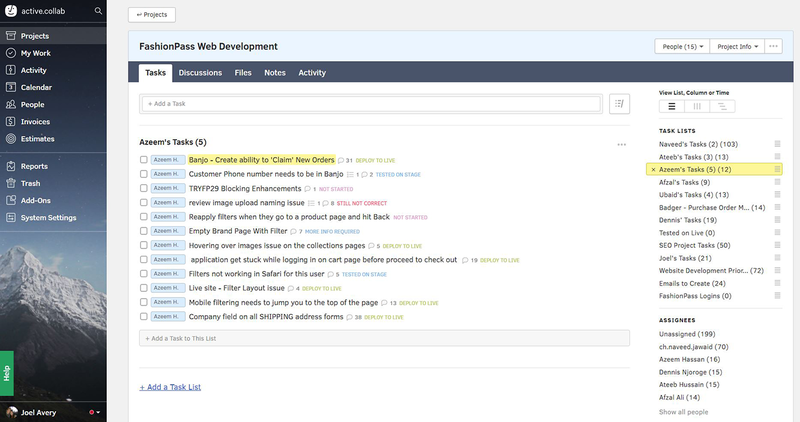 In the software, we are able to assign developers, QAs, and managers to tasks, keep track of images, comments, and search through it all. Most importantly, we can prioritize tasks. That is why our web development department thrives on this system. 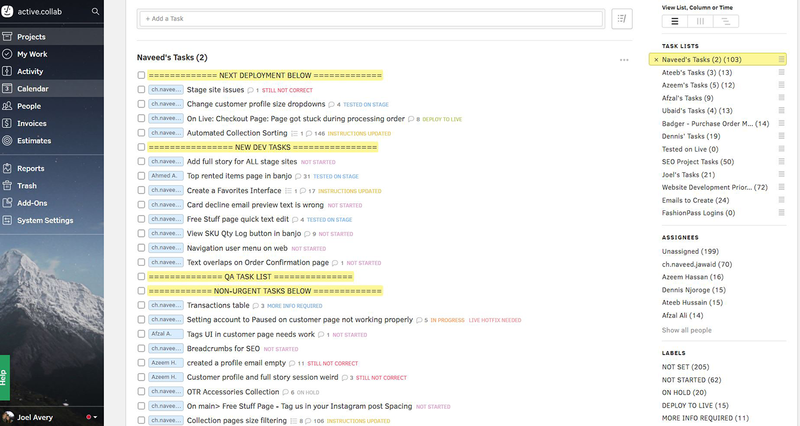 The process goes like this - first we assign each developer their own task list. There is one main task list that our head Scrum Master deals with, and he hands them out to individual developers. Every developer is represented by their name, and then in parenthesis it shows which stage site number they work from. Once the Scrum Master assigns a task to a developer, it’s labeled not started. They begin working on it, and change it to in progress. 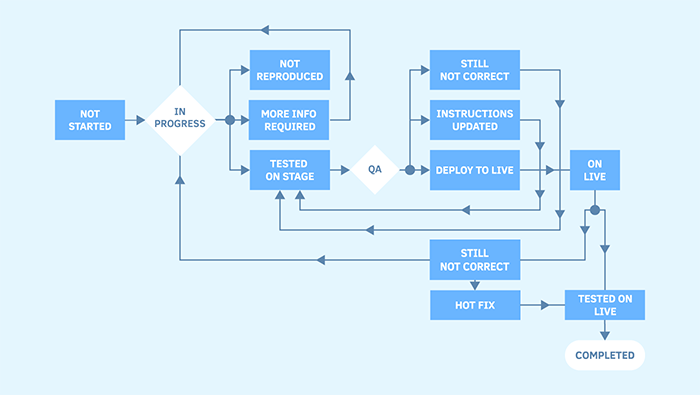 From there, you can easily follow our process in the flowchart below. The goal, of course, is to always clear all the tasks (assuming they were done correctly and fully tested). The main project we have is our customer-facing website. It's pretty straightforward: I come up with the tasks, I create them, and assign them to the Scrum Master, who then assigns them to one of his team developers. I prioritize things for them by constantly dragging tasks up and down. They click on their own name/task list, which brings up all the tasks they’re involved in and can easily view them. Prioritizing is a huge thing for us. Without it, chaos would reign. Having the option to find things from the past is amazing. A lot of times a task gets marked completed, and then you find out later it still needed to be modified. Or you just wanted to be reminded of how it worked, or to see the discussion that took place on the task itself. It's all there, it's all searchable, and it's an absolute lifesaver. Before ActiveCollab, we used Google Docs. Each developer had their own (rather long) document with all of their tasks. When developers would finish a task, they’d highlight it, and I’d archive it on another document. ActiveCollab gave me that exact setup, but in an organized, searchable way. Searching is huge on A/C. Furthermore, I work out of Los Angeles, and the rest of the development team is overseas. Our warehouse, products, and corporate team are all here in LA. However, ActiveCollab makes me feel like my remote colleagues are right in the next room. My business wouldn’t be able to scale without ActiveCollab. I can’t manage development projects without it. Development progress is 75% faster, and bugs are found and addressed significantly quicker now that we are on this platform. 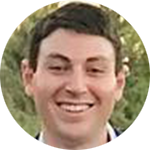 We've looked into Slack and Trello earlier - but they didn’t even come close to ActiveCollab’s capabilities. For us, AC is a no-brainer.